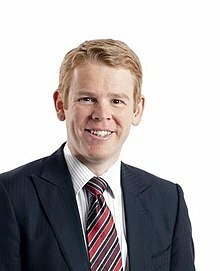 In the New Zealand Parliament, the Leader of the House is the government minister appointed by the Prime Minister of New Zealand to be responsible for the management of government business in the House of Representatives. The Leader of the House is also an ex officio member of the Parliamentary Service Commission. The first Leader of the House was appointed in 1978, although a similar office had existed in Australia since 1951 and another in the United Kingdom for several centuries. The responsibilities of the Leader of the House were previously functions exercised by the Prime Minister. ^ G.A. Wood, ed. (1996). Ministers and Members in the New Zealand Parliament (2nd ed.). Dunedin: University of Otago Press. p. 62. ^ "People in Parliament". New Zealand House of Representatives. Retrieved 13 July 2017. This page was last edited on 18 April 2019, at 03:30 (UTC).